Atoms are small pieces of matter, so they have mass. In this section we discuss the mass scale used for atoms and introduce the concept of atomic weights. Scientists of the nineteenth century were aware that atoms of different elements have different masses. They found, for example, that each 100.0 g of water contains 11.1 g of hydrogen and 88.9 g of oxygen. Thus, water contains 88.9/11.1 = 8 times as much oxygen, by mass, as hydrogen. Once scientists understood that water contains two hydrogen atoms for each oxygen atom, they concluded that an oxygen atom must have 2 × 8 = 16 times as much mass as a hydrogen atom. Hydrogen, the lightest atom, was arbitrarily assigned a relative mass of 1 (no units). Atomic masses of other elements were at first determined relative to this value. Thus, oxygen was assigned an atomic mass of 16. The atomic mass unit is presently defined by assigning a mass of exactly 12 amu to an atom of the 12C isotope of carbon. In these units, an 1H atom has a mass of 1.0078 amu and an 16O atom has a mass of 15.9949 amu. The atomic weights of the elements are listed in both the periodic table and the table of elements inside the front cover of this text. A particular atom of chromium has a mass of 52.94 amu, whereas the atomic weight of chromium is 51.99 amu. Explain the difference in the two masses. Naturally occurring chlorine is 75.78% 35Cl (atomic mass 34.969 amu) and 24.22% 37Cl (atomic mass 36.966 amu). Calculate the atomic weight of chlorine. This answer makes sense: The atomic weight, which is actually the average atomic mass, is between the masses of the two isotopes and is closer to the value of 35Cl, the more abundant isotope. Three isotopes of silicon occur in nature: 28Si (92.23%), atomic mass 27.97693 amu; 29Si (4.68%), atomic mass 28.97649 amu; and 30Si (3.09%), atomic mass 29.97377 amu. Calculate the atomic weight of silicon. The most accurate means for determining atomic weights is provided by the mass spectrometer ( FIGURE 2.12). A gaseous sample is introduced at A and bombarded by a stream of high-energy electrons at B. Collisions between the electrons and the atoms or molecules of the gas produce positively charged particles that are then accelerated toward a negatively charged grid (C). After the particles pass through the grid, they encounter two slits that allow only a narrow beam of particles to pass. This beam then passes between the poles of a magnet, which deflects the particles into a curved path. For particles with the same charge, the extent of deflection depends on mass—the more massive the particle, the less the deflection. The particles are thereby separated according to their masses. By changing the strength of the magnetic field or the accelerating voltage on the grid, charged particles of various masses can be selected to enter the detector. Figure 2.12 A mass spectrometer. Cl atoms are introduced at A and are ionized to form Cl+ ions, which are then directed through a magnetic field. The paths of the ions of the two Cl isotopes diverge as they pass through the field. 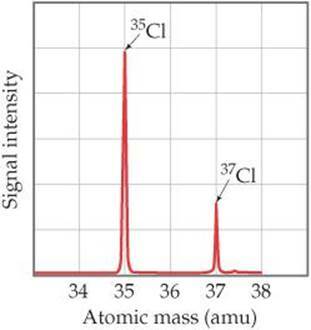 A graph of the intensity of the detector signal versus particle atomic mass is called a mass spectrum ( FIGURE 2.13). Analysis of a mass spectrum gives both the masses of the charged particles reaching the detector and their relative abundances, which are obtained from the signal intensities. Knowing the atomic mass and the abundance of each isotope allows us to calculate the atomic weight of an element, as shown in Sample Exercise 2.4. Mass spectrometers are used extensively today to identify chemical compounds and analyze mixtures of substances. Any molecule that loses electrons can fall apart, forming an array of positively charged fragments. The mass spectrometer measures the masses of these fragments, producing a chemical “fingerprint” of the molecule and providing clues about how the atoms were connected in the original molecule. Thus, a chemist might use this technique to determine the molecular structure of a newly synthesized compound or to identify a pollutant in the environment. Figure 2.13 Mass spectrum of atomic chlorine. The fractional abundances of the isotopes 35Cl and 37Cl are indicated by the relative signal intensities of the beams reaching the detector of the mass spectrometer.